Type LRT (trough system) - Value Tech Ltd. The trough system can also pick up larger amounts of residual concrete for a short time due to its immense volume. Different discharge possibilities are available, e.g. for wheel loader or for pumps. In a closed material circuit, the constituents of the produced material are washed out and the process water re-supplied for production. The LRT 318 is best suited for for the washing out of mortar due to its design. The LRT 422 features a production rate of approx. 10 m³ per hour. With approx. 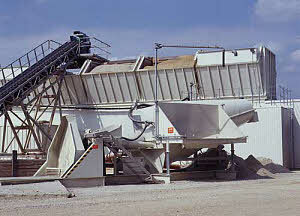 20 m³ hourly output rate, this recycling plant is suited for large amounts of residual concrete.